Internationally, we have a good reputation,Whilst reporting strong figures for the number of start up businesses, our productivty is still amongst one of the lowest when considering OECD reports. ‘A nation of small businesses (MED, 2009, p9), the entrepreneurial nature of our culture is evident among Auckland small businesses in particular, where the city particular rates highly for entrepreneurship and lifestyle factors (OECD, 2008).. Our underlying entrepreneurial tendencies are supported by government (MED, 2009, NZTE, 2009). The definition of any indicator such as size is obviously going to be heavily dependent on its context. OCED (2009) definitions reported that “SMEs are defined as enterprises with 19 or fewer employees and The Ministry of Economic Development appears to maintain this (MED, 2009). But while 19 people may be a small business in other parts of the world, that constitutes 97% of businesses in New Zealand are this size or smaller (MED, 2009). In fact, 68% of our businesses have no employees beyond the owner/operator. (Statistics NZ, 2009). Despite this incongruence, the general consensus is still to stick to that measure. (Business NZ, 2009). With the NZ governments definition of enterprise including such legal entities as ‘companies, partnerships, trusts, incorporated societies, government organisations, voluntary organisations and self employed individuals, among others’ (MED, 2009), it’s likely we have SMEs who aren’t even aware they are one. This ambiguity and lack of awareness SME owner/managers broadly appears to not be uncommon (Gill & MacCormick, 1999). Fundamentally, this unawareness is not restricted to the owner/manager category, broadly there appears to be some under-current of this trend throughout the review. SMEs are not simply smaller versions of big businesses. (Coviello & Martin,1999). And while there have been extensive studies within the field of “small business” in the NZ context, particularly by public sector agencies, the majority of these do not focus on what would technically be considered as one. The majority of government initiatives and studies feature considerations of businesses with turnover of $1M+ or at least 6 employees (Statistics NZ, 2009).Subsequently, they have excluded the large amount of this market whom do not fulfil this criteria. There is wide discussion within these areas with concerns for growth. The “3b syndrome” or ‘boat. Batch and beemer” (NZTE, 2009) phenomenon has been widely debated and discussed. It concerns the activity of “lifestyle entrepreneurs” and their role in economies and societies (Massey, 2004). Overall the world has in recent years experienced a social trend and concern towards sustainability and environmentally friendly. Now not only are we beginning to recognise in the mainstream the need to correct this, but there has been a shift towards the recognition of “biosphere economy” (Volans, 2010). The shift in power among the different generations is acting as a catalyst for these changes to be faced, or so we do assume. The size, flexibility and nature of the SME places them in good stead to make maximum advantage as these changes continue to become more main stream in society. The management capabilities of owner/managers and other SMEs in NZ are widely recognised to be one of the markets biggest shortcomings. Their size, on the one hand, provides considerable advantages over the economies current leaders, the Multi-National Corporation (MNC) whom have none of the same ability to be flexible and dynamic (Williamson, 2009). On the other hand, this is at the same time what limits their ability and level of achievement. Hardworking and innovative, the NZ workforce has strong potential, and is one of the higher educated markets internationally (OECD, 2009). Despite this, SMEs owner / managers will be required to actively consider how they manage this new form of speedy and connected business. The lack of resourcing capabilities within SMEs may explain the lack of uptake with SNSs also. However it is important that the value of these be appreciated by the SME sector, as the unique reality is that the advantages afforded to MNCs through their size, in terms of resources and human capability, potentially can equally be available to SMEs through collaboration. SNSs are the key link, providing us with new and more effective ways to negotiate, organise and facilitate such collaborations. Lewis’s (2009) considerations in to young NZ entrepreneurs and the trends of highlights the “aspirational” identities driving the new age of entrepreneurs. They do not identify with the role of being a small firm owner –which imitated perceived mundanely , not a notion that was reconciled easily or resonated with the style of work-life common among them (Lewis, 2009, p135). Ultimately, in an information age, especially one which is found in markets valuing instant gratification, whether they are aware of it or not, every individual is in fact operating as a brand themselves. Ried Hoffmann (one of the founders of LinkedIn) put it best when he describes how he came up with the concept; “I think everyone is now an entrepreneur, whether they realise it or not. The average job is 2-4 years- that makes you a small business, the business of yourself” (Hoffman, as cited in Rao, 2009). The unique situation and context that NZ presents along with the innovative approaches adopted by Kiwi Entrepreneurs are by themselves emphasis enough of the need to consider the contingents in this context. Networks are important in the NZ context, potentially more so than so other places in the world (Hairsine, 2010) especially relevant within small markets like ours, and the relevance of approaches such as word of mouth advertising, are both more immediate and in turn more obvious. The long standing recognition of word of mouth advertising alone in NZ would assumedly assist the appreciation of SNSs, yet we are really only beginning to see their value and potential becoming increasing appreciated in the mainstream. Rob Treacher, Director of Auckland Company, AMPM, put it succulently in an episode of Campbell Live (the TV3 Current Affairs Programme) last week when he referred to SNS as ‘word of mouth on steroids’ (Campbell Live, 2010). NZ has a unique set of circumstances that make up our markets. Historical traditions of both creativity and agriculture generate dynamic industries at their conjunction. While we have examples of great Kiwi innovations and people “making the big time” offshore, internally the nature of markets and business may be different to how they might appear from an outsider’s perspective. Rife with the influence of tall poppy syndrome there is an undertone within New Zealand society which can be considered ultimately rather nasty, with reluctance to celebrate achievement and aspirations of mediocrity On the other hand this is balanced out by the community spirit and hard working nature of Kiwis. Being innovative, Kiwis have a tendency to make the situations they have work best for them, and often that means taking somewhat of a creative approach and have been referred to as last-end adopters (NZTE, 2009). Small and limited markets and an entrepreneurial spirit has lead to many hardworking Kiwis to establish their own businesses for centuries. In fact, so intrinsic to our cultures, that the desire to seek autonomy (Van Gelderen & Jansen, 2006) is comparable with the desire to own your own home (Ministry of Economic Development, 2000a, p. 4). Such drivers lend themselves as explanatory factors to the ongoing growth and innovation demonstrated by SMEs. And whilst there is no debate of our innovative nature, the ability of Kiwis to capitalize on the value of the ideas that we produce, seems less apparent (Statistics NZ,2009) . We have a tendency to work harder, but not smarter (NZTE, 2009). The workforce and New Zealand markets have remained comparatively sheltered from recessive forces, however we are still demonstrating some of the common trends resulting from it. It is disconcerting to consider the recent international trend also still effecting us here, youth unemployment rates are highest they have been in consider the relative figures around innovation and development, whereby Statistics NZ (2009) found trends indicating that the larger the business, the more likely to innovate. NZ Initiatives and Government activity within the ICT area has been developed as the Digital Strategy for NZ since the nineties (NZ Government, 2006).The e-government initiatives and evidence of these required structural changes well underway within many government departments and state owned enterprises (consider the “Auckland Super City” initiatives which have seen wide publication recently), whom from all accounts appear (although do not explicitly state) to looking toward the “cloud computing” movement which is the current “in thing” amongst developer and techs alike. The Digital Strategy Advisory Group, established in 2000, is just one aspect of government changes which as part of the process of transitioning to an e-Government by 2020, are making publically available a lot of useful information. Recognising the importance of this movement, the NZ Government was the first internationally, to make this move towards being online. The Companies Office introduced the first online business registration internationally in 1996 and appreciating the potential, now focus on up skilling and enabling business owners to leverage the resources available to them (NZ Companies Office, 2006). The ICTs now enable us to utilize our networks faster, enable them to span further and create almost unlimited uses (MED, 2007). 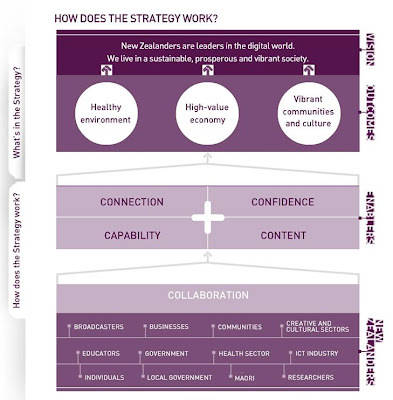 The government’s “G20” initiatives (preparing and establishing NZ’s e-government) and evidence of these required structural changes well underway within our state owned enterprises (consider the “Auckland Supercity” initiatives which have seen wide publication recently). There are a wide variety of initiatives, projects and efforts being undertaken, from both the public and private sectors in NZ, to ensure ‘an e-literate population with optimal access to ICTs’ (MED, 2000b, p1). Despite these extensive efforts (more details in virtual version), the uptake of ICTs in broader NZ communities and businesses has been patchy (MED, 2000a, 2000b, 2006). One of the main strategic concerns receiving the focus of government centres on improving the general populations’ capabilities and confidence with ICTs. The latest version of their Digital Strategy Submission used the ICTs available to them to create an interactive document which inspired my interpretation to be utilised here (the visual summary which they utilise online can be seen as Figure 4). More information about the different aspects and elements of this government progress can be found in the virtual version but ultimately, the work being completed has provided a solid and insightful array of research, review and reports being made available which have been heavily referred to within this review. The NZ government recognizes that ‘motivating and training’ of the general public is required to address concerns of the “digital divide”. There have been a variety of initiatives that the government bodies have been working on over the past few years as we have experienced the wider spread of technology. We are now found within what MED referred to as the transition phase, the second phase in the expected changes as contexts adapt forced by the influences from a general purpose technologies. Despite our high ICT adoption levels, the digital divide in NZ is relatively significant by international standards (OECD, 2009) and innovation. Whilst I did uncover some interesting concepts and potential within these concerns that will not be addressed in this review and some further information can be found online.